I've written before about how the link between spa-ing and nature -- eco-therapy -- can have an enormously beneficial effect on our mental health. Small wonder then, that the natural hot springs in Colorado at Glenwood Springs, in the heart of the American Rocky Mountains, made me feel thoroughly blissed out and at one with nature. The Ute Native Americans used to bathe in the hot springs and believed that the waters had sacred powers, thanks to the healing properties of the mineral-rich waters. It's a smart way to look at it; how almost-magical, that just from bathing or drinking water, you can heal your body. 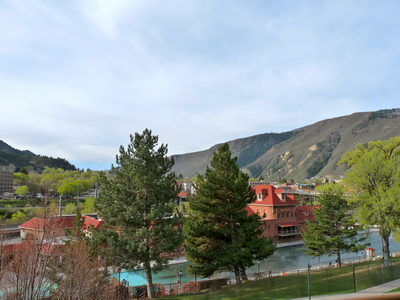 The pool at Glenwood Springs is geo-thermally heated and packed with sulphur, potassium and magnesium, which means, yes, it does have a little bit of a rotten-egg smell, but you very quickly stop noticing that. There are two kinds of experience going on at the springs. First, there's the pool itself. It's the largest of its kind in North America. I first tried it a few hours after I'd arrived, so I could experience it at sunset. The changing rooms are very municipal-bath-ish and it's very basic, no luxury or frills of any kind at all. The pool is huge and it's like stepping into a warm bath. The pool has a sloping floor, so I strode through the water to the end, so I could bob up and down, my shoulders under the water. I lay back and watched the light change on the red rocks of the mountains across from the spa. Golden, honey-coloured, then slowly fading away. It was magical. I dreamily wandered back to the shallow end and hopped into the smaller, hotter pool for a 20-minute soak. I had an amazing night's sleep that night. The next morning, I tried a daytime soak. I loved that there was yet another separate pool to swim in. I tried a swim but a combination of the altitude (Glenwood Springs is 5,763 feet above sea level; that's more than a mile) and the warmth of the pool made me sluggish, and I found more than a few laps almost impossible. I liked that Glenwood Springs is clearly an all-ages experience. Seniors and children alike were enjoying the waters. This is no refined spa-pool. This is definitely a family day out. The cafe attached to the spa serves basic cafeteria fodder, so I didn't have particularly high hopes for the spa. I couldn't have been more wrong. The Spa of the Rockies is a new development that felt, to me, very Willow Stream-ish. The reception was bright and clean with products a-plenty, and helpful, friendly staff. After filling in a consultation form, I was whisked to the lovely changing rooms through softly lit corridors complete with soothing art and thickly-carpeted floors. I love North American spas -- they have changing rooms down to a fine art: hair products, tampax, cleanser, lashings of moisturisers; all wonderful. Then to the Serenity relaxation room, where I found dried fruit and nuts to snack on, delicious iced raspberry tea and soft cashmere blankets and day beds. I was almost sad when my therapist arrived. We went upstairs to a large and beautifully decorated room with its own fireplace. I was down to try a full-body massage, and with my aching back and shoulders stiff after a long flight, couldn't wait. Just wow. What a treatment. 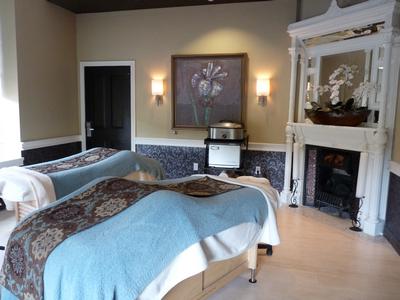 My therapist slipped hot pads over my tight muscles and a hot towel under my stiff neck. She massaged me with arnica and a eucalyptus-wintergreen oil blend to soothe and unwind those tight muscles. What an exceptional therapist. I'm embarrassed to say I went into that rare but lovely state of spa-bliss: somewhere between unconscious and asleep and oh, so very happy. My therapist's experienced fingers dug deep into the knots around my neck, arms and shoulders. Although it was painful, I felt incredible the next day and have felt the benefits for weeks afterwards. Amtrak's California Zephyr train, which travels between Chicago and San Francisco, stops off just two minutes from the springs. If you're in the USA and fancy a break with a difference, hop on board and let the train take the strain. See the country from the comfort of your own cabin then stop off to soak up some of that magical healing water at the Spa of the Rockies.